پور موحد, زهرا, یاسینی اردکانی, سید مجتبی, کلانی, زهره, علاقبند, مریم. (1396). بررسی ارتباط خستگی و افسردگی در دانشجویان دانشگاه علوم پزشکی شهید صدوقی یزد در سال 1393. 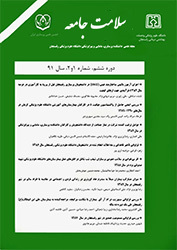 سلامت جامعه, 9(3), 63-73. زهرا پور موحد; سید مجتبی یاسینی اردکانی; زهره کلانی; مریم علاقبند. "بررسی ارتباط خستگی و افسردگی در دانشجویان دانشگاه علوم پزشکی شهید صدوقی یزد در سال 1393". سلامت جامعه, 9, 3, 1396, 63-73. پور موحد, زهرا, یاسینی اردکانی, سید مجتبی, کلانی, زهره, علاقبند, مریم. (1396). 'بررسی ارتباط خستگی و افسردگی در دانشجویان دانشگاه علوم پزشکی شهید صدوقی یزد در سال 1393', سلامت جامعه, 9(3), pp. 63-73. پور موحد, زهرا, یاسینی اردکانی, سید مجتبی, کلانی, زهره, علاقبند, مریم. بررسی ارتباط خستگی و افسردگی در دانشجویان دانشگاه علوم پزشکی شهید صدوقی یزد در سال 1393. سلامت جامعه, 1396; 9(3): 63-73. مقدمه: خستگی و افسردگی در دانشجویان بر انجام کار، زندگی خانوادگی و روابط اجتماعی آنها اثرات منفی گذاشته و منجر به کاهش عملکرد اجتماعی، شغلی و تحصیلی آنها می‌گردد. این مطالعه باهدف بررسی ارتباط خستگی و افسردگی در دانشجویان دانشگاه علوم پزشکی شهید صدوقی یزد در سال 1393 انجام شد. مواد و روش‌ها: این پژوهش بر روی 315 دانشجو در دانشکده‌های دانشگاه علوم پزشکی شهید صدوقی یزد به روش چند مرحله‌ای انجام گردید. جهت جمع‌آوری اطلاعات از پرسشنامه‌های اطلاعات دموگرافیک، معیار خستگیIowa Fatigue Scale و معیار افسردگی Beck استفاده شد. داده‌ها با استفاده از آزمون‌های آماری آنالیز واریانس، تی تست، من ویت نی ، کای اسکوار و ضریب همبستگی پیرسون و اسپیرمن مورد تجزیه و تحلیل قرار گرفت. یافته‌ها: ارتباط بین میانگین افسردگی و وجود مشکل مالی در دانشجویان و علاقه به رشته تحصیلی (001/0p=) و ارتباط بین میانگین خستگی و جنس (0001/0>p)، رشته تحصیلی و وجود مشکل مالی (007/0p=)، علاقه به رشته تحصیلی (0001/0p<) و وجود بیماری جسمی (008/0p=) معنی‌دار شد. همبستگی بین نمره خستگی و افسردگی دانشجویان با آزمون همبستگی پیرسون مثبت و معنی‌دار گردید. (000/0p< و 581/0r=). نتیجه‌گیری: با وجود همبستگی مثبت و معنی‌دار بین خستگی و افسردگی دانشجویان و نتایج حاصله به نظر می رسد که با ایجاد امکانات بیشتر و حمایت مالی دانشجویان بتوان علاقه‌مندی به رشته تحصیلی را افزایش و خستگی و افسردگی را در آنها کاهش داد. Introduction: Fatigue in students has negative consequences on occupational, social, and familial functions and may give rise to depression. Meanwhile, depression in students may disturb the academic function and become as impediment for academic achievements. This study aimed to investigate the relashionship between depression and fatigue in the students of Shahid sadoughi University of medical Sciences in Yazd, Iran in 2014. Material and methods: In this cross sectional descriptive analytical study,315 students were selected through a multi-stages sampling method among the students of Shahid Sadoughi Universiry in 2014 in Yazd. Data were collected by demographic questionnaire, IOWA fatigue scale and Beck depression inventory scale. Data were analyzed by SPSS 16 software using ANOVA, chi-square, t-test, Pearson and Spearman correlation test. Results: There was a significant relationship between depression, interest to study extension and economical problems (p=0.001). Also, there was a significant relationship between fatigue, gender (p<0.000), study extention and economical problems (p=0.007), interest to study extention (p< 0.000) and physical diseases (p=0.008) and depression according to pearson correlation test. (p=0.000, r=0.581). Conclusion: Economical problems and study extension interest are significantly related to depression and fatigue. By improving the economical support and increasing students, interest to study extension, depression and fatigue would be decreased and their academic function would also be increased. Rella Samantha, Winwood Peter C, Lushington Kurt. When does nursing burnout begin? An investigation of the fatigue experience of Australian nursing students. Journal of Nursing Management 2008; 17: 886-97. Portnoy D. Burnout and compassion fatigue: watch for the signs. Health Progress (Saint Louis, Mo) 2011;92(4):46-50. Emery L, Sitler M, Ryan J. Mode of action and angular velocity fatigue response of the hamstrings and quadriceps. Isokinetics and Exercise Science 1994;4(3):91-5. Taylor JL, Butler JE, Gandevia S. Changes in muscle afferents, motoneurons and motor drive during muscle fatigue. European journal of applied physiology 2000;83(2-3):106-15. Lamiaa I, Kesh k , Dalia S, Abd El-Moneem . Effect of Nurses’ Work Hours and Fatigue on Occurrence of Medication Errors in ICU and Medical Oncology Unit –Cairo University. Life Science Journal 2012;9(3):347-55. McCann K, Boore JR. Fatigue in persons with renal failure who require maintenance haemodialysis. Journal of Advanced Nursing 2000;32(5):1132-42. Jalal EJ, Hajibabaee F, Farahaninia M, Joolaee S, Hosseini F. Relationship between job satisfaction, absence from work and turnover among nurses. Journal of Nursing and Midwifery Sciences 2014;1(1):12-8. Yumang-Ross DJ, Burns C. Shift Work and Employee Fatigue Implications for Occupational Health Nursing. Workplace health & safety 2014;62(6):256-61. Potter P, Deshields T, Divanbeigi J, Berger J, Cipriano D, Norris L, et al. Compassion fatigue and burnout: prevalence among oncology nurses. Clinical journal of oncology nursing 2010;14(5):E56-E62. Punja S, Shamseer L, Olson K, Vohra S. Rhodiola rosea for mental and physical fatigue in nursing students: a randomized controlled trial. PloS one 2014;9(9):e108416. Sparks RS, Taylors CM. Nursing diagnosis. 6th ed. Philadelphia:Lippincott Williams and Wilkins;2005: 102-4. Rella S, Winwood PC, Lushington K. When does nursing burnout begin? An investigation of the fatigue experience of Australian nursing students. Journal of nursing management 2009;17(7):886-97. Najafipour S, Najafipour F, Yaktatalab S. P-509-The prevalence depression and relationships with academic failure on students of jahrom university medical science. European Psychiatry 2012;27(1):1. Safiri S,Khanjani N,Kusha A,Narimani MR,Karamzad N. Prevalence of depression and its associated factors using Beck Depression Inventory among students of School of Health and Nutrition, Tabriz, Iran in 2009 . J Analyt Res Clin Med 2013; 1(2): 83-9. Puffer J, McShane J. Depression and chronic fatigue in the college student-athlete. Primary care 1991;18(2): 279-308. Hartz A, Bentler S, Watson D. Measuring fatigue severity in primary care patients. Journal of psychosomatic research 2003;54(6):515-21. Sadock B. Sadock V. Comprehensive text book of psychiatry, 7th ed. Philadelphia: lippincotte Williams & wilkins press; 2000: 769. Tyler P, Cushway D. Stress, coping and mental well‐being in hospital nurses. Stress medicine 1992;8(2):91-8. Vazquez FL, Blanco V. Symptoms of Depression and Related Factors among Spanish University Students 1. Psychological reports 2006;99(2):583-90. Amaducci CdM, Mota DDFdC, Pimenta CAdM. Fatigue among nursing undergraduate students. Revista da Escola de Enfermagem da USP 2010;44(4):1052-8. Loge JH, Ekeberg Ø, Kaasa S. Fatigue in the general Norwegian population: normative data and associations. Journal of psychosomatic research 1998;45(1):53-65. Kaplan HI, Sadock B. Comprehensive textbook of psychiatry. 6th ed. London: Williams and wilkins Co; 1998: 524-73. Watanabe N. A survey of mental health of university students in Japan. International Medical Journal 1995; 6: 175-9. Smith-Miller CA, Shaw-Kokot J, Curro B, Jones CB. An integrative review: fatigue among nurses in acute care settings. Journal of Nursing Administration 2014;44(9):487-94. Kim S, Kim J. Mood after various brief exercise and sport modes: aerobics, hip-hop dancing, ice skating, and body conditioning 1.Perceptual and motor skills 2007;104(3c):1265-70. El-bar N, Levy A, Wald HS, Biderman A. Compassion fatigue, burnout and compassion satisfaction among family physicians in the Negev area-a cross-sectional study. Isr J health policy res 2013;2(1):31-9. Brough P. A comparative investigation of the predictors of work-related psychological well-being within police, fire and ambulance workers. New Zealand Journal of Psychology 2005;34(2):127-34. Tanaka M, Fukuda S, Mizuno K, Kuratsune H, Watanabe Y. Stress and coping styles are associated with severe fatigue in medical students. Behavioral Medicine 2009;35(3):87-92.